For some kids the start of preschool can be a very scary thing. For others it can be very exciting. 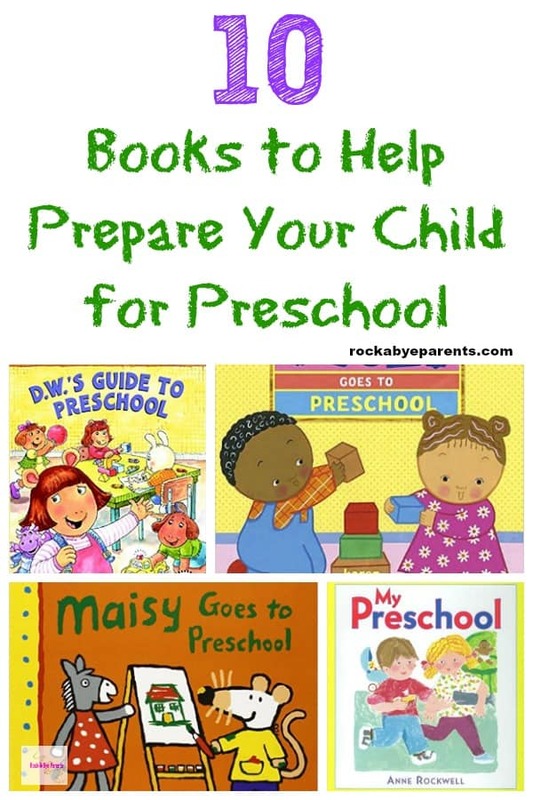 No matter which category your child falls into you can help get them prepared and increase their excitement by reading with them books about going to preschool. It’s hard to believe that it’s now been a few years since I was reading books about going to preschool to Nick to help get him ready for it. Nick’s preschool was part of his daycare, so the transition wasn’t too hard for him. It was a still a change to more structured learning though, so I felt it was important to get him prepared and excited for it. These books did help Nick. By the time the first day of preschool came Nick was bursting with excitement. The night before it started he was walking around the house in his PJs with his new backpack on. 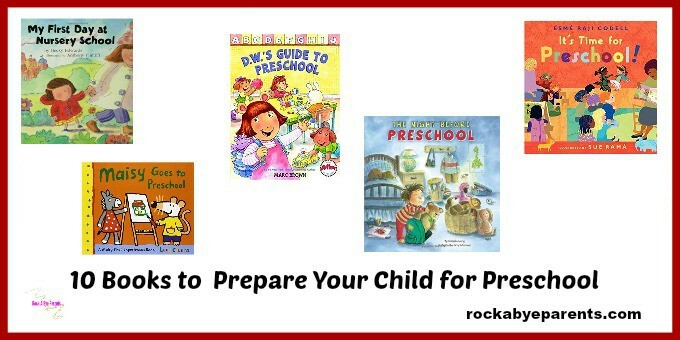 I hope that these books help your little one get ready for the transition to preschool. Click on the book’s name or picture to learn more about the book or to order it from Amazon! Preschool for Maisy means a day filled with friends and things to do, from the time she hangs her coat on a special peg to the time she says good-bye. There’s painting and snack time, stories and nap time (and a bathroom break in between). Soon everyone’s ready to haul out the instruments and make some noise, then head outside for a turn at the sandbox or slide. In a bright, full-size storybook full of familiar scenes, this child-friendly look at a day in the life of a preschooler is one that newcomers and seasoned pros alike will be happy to share. It’s the first day of preschool, and the narrator, Rosie, knows everything a new preschooler needs to know. Rosie introduces the reader to her cubby, her teacher, her reading circle, her music class, her lunch table, and more. “I want my mommy!” is this hesitant little girl’s response to her first day at nursery school. But after she gets involved with glue-y projects, singing and dancing, painting, game playing and meeting new friends, she gradually changes her mind about nursery school. Children (and parents!) who are anxious about the transition to daycare or preschool will find this book both spirited and comforting. The clever front and back jacket illustrations hint at the happy ending and the interior art is playful and bursting with color. What’s a day in preschool like? Come inside and see! Every preschooler will relate to this empowering text that is fun to both hear and say. “Hi to teacher,/Coat on hook./ Run to shelf/ And find a book.// Painty hands and/ Gooey glue./ Tricky puzzles/ I can do!” In a durable big-kid format (POB with light cardstock pages), with bright and active illustrations that celebrate a happy place where kids learn to love school. Going to school for the first time is a very big step. Follow Johnny through his day as he and his pal T-Rex go to pre-k for the first time. It’s hard to believe, but your child’s starting preschool. Even if it’s just for a couple of hours two or three days a week, it seems such a big step for someone in such little sneakers. Not to worry — we’re here to help prepare both of you for that step. We’ll answer your child’s questions about what preschool is like, what preschoolers do, who teachers are, and how they help to make preschool such a fun and special place — so that the first day of preschool will be a day you’ll both look forward to. Arthur’s sister D.W. offers friendly, no-nonsense advice to help preschoolers get through their first day of school. Books are such a great way to help children be prepared for new experiences in their lives. These books about going to preschool are exactly what many kids need to get excited and to feel comfortable with the transition to preschool. These look like great books. These would be perfect for my grandson. My son is 3 and he’s going to start preschool on September the 5th. Thank you for these recommendations! I hope he has a great year! 😀 We head back to school on the 5th as well. I can’t believe how fast the summer went.